So far I’ve shared how I found out I was overweight, and the many false-starts among my dieting journey and how I learned about the sugar free life style, now what? So now I’m convinced. 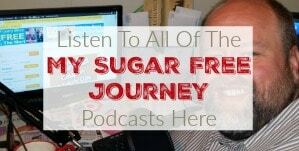 I have seen the evidence and it is overwhelming, fructose is making us fat, so now what? I needed a plan. 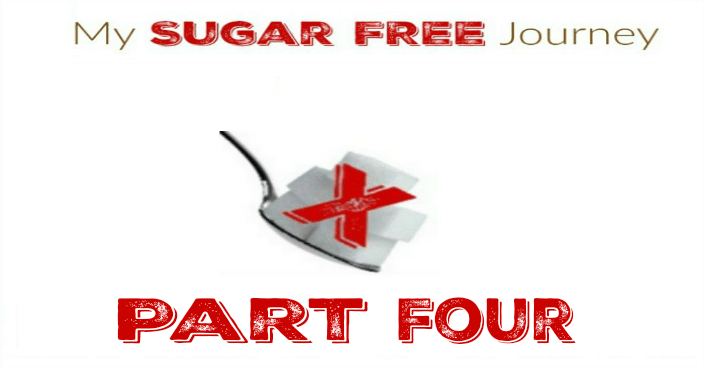 First step – Where is the sugar? The first thing I did was spent a week paying very close attention to what I ate and figuring out exactly where the sugar was coming from. It only took me a few days to realize that I had probably not had a meal in years that didn’t include some kind of sugar. It was in the bread, it was in the spices, it was in almost every side dish I pulled out of the freezer, it was in a lot of the meat I was preparing, it was EVERYWHERE! I was drowning in a sea of sugar and didn’t even know. I will never forget the day it was absolutely driven home just how prevalent sugar was. I worked very hard to prepare a nice dinner for my family with no sugar and just as I finished up, I reached for a little garlic salt to season the fresh steamed broccoli. It was only AFTER I sprinkled it on my veggies that I thought to look at the ingredients. First ingredient – salt, second ingredient – Garlic powder, third ingredient? – SUGAR! 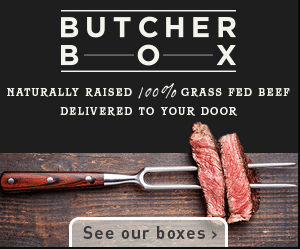 I couldn’t believe I had done that and I couldn’t believe there was a company out there that was putting sugar in garlic salt! Clearly this was going to be an uphill battle. It was easy to cut out the obvious things. No more late night McFlurries when I picked my son up from work, no more non-diet soda, etc. 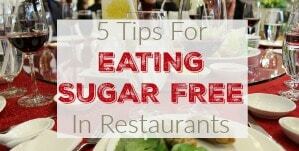 What I was having trouble with was when I ate food I didn’t prepare (which spawned my What’s Sugar Free at Restaurants series) and what did I do about all the staples and condiments that were now off limits? The first hurdle I had to overcome was bread. It is almost impossible to find bread made without sugar. The closest I was able to come was carb balanced Mission tortillas which are great but sometimes you want a sandwich. So I found a recipe for bread and made it a few times but hand-making bread is about the most time-consuming thing you could ever do. So I scoured Craigslist and found a bread machine for $15. If you are serious about kicking sugar out of your life, a bread machine is the most awesome thing you can ever buy. Just substitute Barley Malt Syrup (a sweetener that contains no fructose) or Dextrose (Just pure Glucose) for any sugar in any recipe and you will be fine. It takes all of 5 minutes to throw the ingredients in and then you just walk away for a few hours and come back to a loaf of delicious bread. UPDATE – Having moved a little further along on my sugar free journey, I got to the point where the bread maker isn’t a part of our lives anymore. As I continues to study I realized that grains are just as bad for me as the sugar. I still bring it out on special occasions because the family likes it but I no longer eat bread. Second up was condiments. I will say this, for my entire life I have hated mustard. I think it goes back to my childhood where Miracle Whip was the condiment of choice. If you are unfamiliar with Miracle Whip, it’s basically Mayo with a ton of sugar added. In fact, the whole time I was growing up eating Miracle Whip, my family called it mayo so that’s what I thought mayo was. Imagine my surprise the first time I actually had mayo and couldn’t figure out why it was so bland…I was just missing all that sugar! And of course mustard is light years away from Miracle Whip on the sweetness scale so I REALLY wasn’t interested in that. That is, until I stopped eating sugar. Now that my taste buds aren’t so screwed up, mustard tastes pretty good which is fortunate because it’s pretty much the only condiment available without sugar off the shelf. Dian and I devoted last Saturday afternoon to experimenting with trying to make a palatable mayo out of an egg and some olive oil. We will put the recipe up later but it taught me the importance of experimentation to try to find things that work for you and taste good. It took us a while but we finally got something that tasted great in tuna salad. We will be putting that recipe up soon and then we get to work on figuring out ketchup. Of course the other thing that has been great about this is the health benefits. I’m only 6 weeks into the experiment but having seen how easy it has been to lose weight and keep it off and the MASSIVE drop in my blood pressure, (220/160 to 131/86 at my last doctor’s appointment) Dian and I have decided that this is what our lives will look like for the rest of our lives. It’s the first time I have been comfortable saying that about any change to my diet, I’ve always assumes that any changes would come to an end and I would be back to pints of Ben and Jerry’s before too long. Not this time, this is too easy and the benefits are too great. Thank you for reading about my sugar free journey. I would like to connect with you, please leave a comment or use the icons in the top right hand side bar to follow my on Facebook or Pinterest or you can sign up for my daily email. Right on about sugar! Guacamole – 1 mashed avocado + 2 T. salsa, mix it together and enjoy. Have you watched the 2015 documentary out on Netflix about the dangers of sugar in the American diet. I think it’s called Sugar Coated. I think the hardest thing for me trying to lose weight is sugar in my tea and coffee. I need to go back to an alternative sweetner. 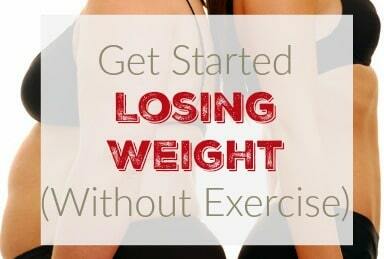 It’s so hard to get started. I have heard of using tomato paste or sun-dried tomato paste as a substitute for ketchup. May be worth a try. My husband has been told he is very close to being diabetic and if he doesn’t change his diet he is in trouble. 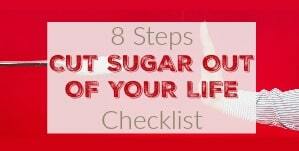 We are both over weight and have started cooking healthy but I had no idea about sugar until I came across this blog. Thank you so much! So glad to hear that! Let me know if I can do anything to help. Having a support team was crucial to my success so far. You need people in your corner rooting for you. 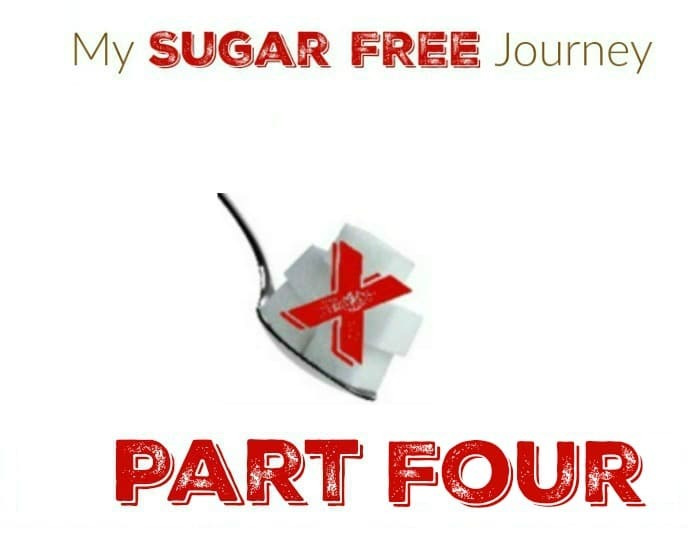 I enjoyed reading about your sugar free journey! I’ve just begun one of my own. 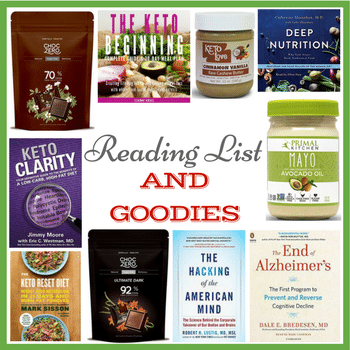 I’ve read a few eye-opening, jaw-dropping books on the health dangers associated with sugar. ‘Nough said. – The hard part is getting our kids switched over. It’s an uphill battle. Your site is encouraging! You are so right about the kids. I really think the best you can do is to not allow it in your house and ask them to support you as you improve your health, then throw out all the junk. If they have a Coke on their own time then so be it but you can definitely enlist their support. My family has struggled for years at dieting and while we knew that sugar was an issue (maybe not to the full extent) we didn’t think cutting it out completely would be possible. Finding your videos and articles has got me so excited. And I have to tell you that not even an hour before finding it, I said a desperate prayer to God asking for His help in losing weight! Thank you! That’s so awesome to hear! You will probably want to join our Facebook support group in case you have any questions. I found your story both interesting and inspiring. I am on a sugar-free journey of my own. My weight just kept going up and up and I couldn’t figure out why. I wasn’t taking in a lot of calories but too much of the wrong foods. My blood pressure skyrocketed. I am about seven weeks into this journey and am down about 16 pounds. 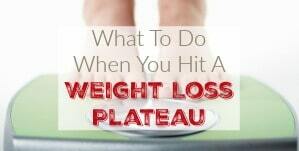 My goal is to get off of blood pressure medications and lose a lot more weight. Thank you for sharing your story. Awesome! I’m so glad to hear that. I was amazed at how quickly things began to change for me once I cut out the carbs. Let me know how it goes and what I can do to help! Your blog is AMAZING! I have been struggling to explain to family and friends why sugar is so problematic, and yet comprises a huge part of American diets– you have so many good talking points in here. Thank you for writing!! Thank you so much! Glad you found it!